Long running and highly developed, Veranda is a full service resort complex with 40 rooms that has become a year-round favourite for families. Ad Book now! Rates from US$80++. Average rating 8.6 from 555 reviews. Set in a very pleasant and breezy spot with uninterrupted views, Veranda is popular with Phnom Penh expats, so book ahead if you’ll be there over the weekend -- especially a holiday weekend. Accommodation ranges from fairly standard-sized wooden bungalows through to massive family-sized stone built villas with private pools. The focal point is a wide, tiered restaurant and bar, which boasts some of the best views across the sea to Bokor to be had in the area. If you’re staying at a lower-priced place nearby, we recommend popping in here for a sunset cocktail or trying the generous, eclectic breakfast buffet ($8 for visitors, inclusive for guests). Though all have hot water and WiFi, each bungalow is different and they can be a bit variable when it comes to amenities and positioning -- so try to see as many rooms as possible before settling on one. Some bathrooms are open, and the rooms underneath the restaurant are not ideal if you like a lie-in. All the tucked away bungalows are interconnected by a series of elevated wooden walkways that bring the jungle feel right to your feet. There are two pools: an infinity pool exclusively for guests, and a large shady pool with a bar, which is open to outsiders for a fee: $8 for adults and $6 for kids. The nearby Happy Hut offers crafts, face-painting and circus skills for kids; babysitting is also available from $10 per hour. With a bakery, spa, bookshop, ice-cream outlet, pharmacy and shop across the road, it might take some effort to leave and explore Kep, but bicycles are available and the national park is right behind the resort. We did think that charging $3.25 for a little better than bog-standard coffee was more than a little bit over the top, and we also have reservations about the dogs in the restaurant, not because there are dogs in the restaurant — we personally think there should be more dogs in restaurants, everywhere — but because on more than one occasion they came across as quite aggressive. We’ve never met an aggressive dog we can’t mollify, but are not sure how many children can say the same. 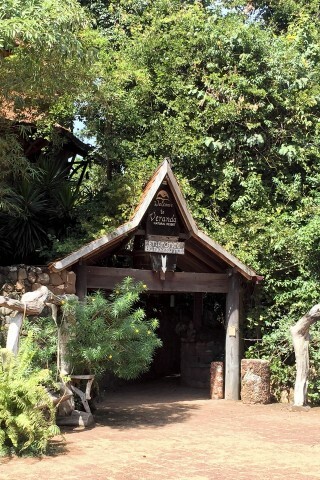 Check rates at Veranda Natural Resort on Booking.com. Room: Private pool villa, low season: US$560, high season US$560. Notes: Sleeps up to eight.